The state Senate on Friday approved a fiscally responsible budget for Fiscal Year 2018-2019 that holds the line on spending, increases funding for education and school safety initiatives, and includes no new taxes. While the funding is critical, we are fully aware that additional money won’t solve the problem alone – we need to look at programs and resources that school districts can use to keep our kids safe. A number of measures have already been introduced, and our School Safety Task Force is still developing additional initiatives. We will use the summer to hold hearings, gather public feedback and work on a final product. 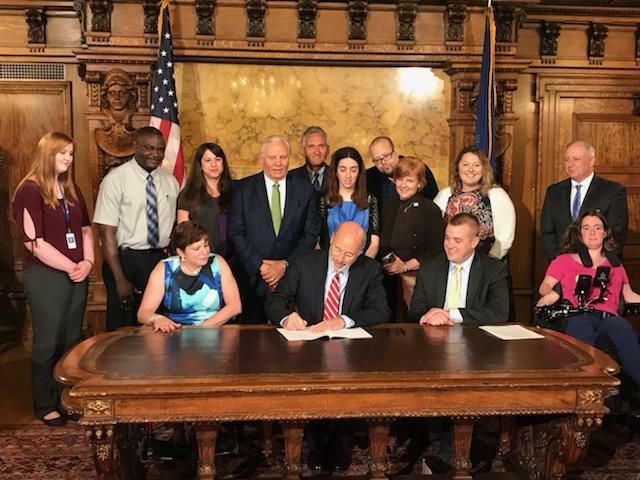 Legislation I championed to promote the employment of people with disabilities at competitive wages in Pennsylvania received final legislative approval and was signed into law. House Bill 1641 is a companion to Senate Bill 21, the “Employment First Act,” I introduced last year. It calls for state agencies to employ individuals with disabilities in at least seven percent of the overall state workforce. Across our Commonwealth today, too many people with disabilities spend their days working in segregated facilities for wages well below the minimum wage. Enactment of the Employment First Act will provide people with disabilities the opportunity to work at competitive wages in a wide range of jobs. While Pennsylvania faces a shortage of workers, more and more employers are finding that people with disabilities are productive, responsible and dependable employees. The General Assembly has taken an important step for the Commonwealth and for people with disabilities – especially those with intellectual disabilities. The complete package of Fiscal Year 2018-19 budget bills also received final legislative approval on Friday. Two of these bills contained provisions from bills I sponsored. House Bill 1929, the Fiscal Code component, includes language from Senate Bill 1058, which defines what constitutes abandoned property in regard to securities. For a security to be considered abandoned the holder would have to have not increased or decreased the principal, accepted payment of principal or income, or otherwise indicated an interest in the property or in other property of the owner in possession, custody or control of the holder within a consecutive three-year period. It also provides for the calculation of the date on which a holder lost contact with the owner of the securities, including communications via mail and electronic mail. The Senate approved legislation I co-sponsored that would provide students with alternatives to Keystone Exams to fulfill high school graduation requirements. The Senate Aging & Youth Committee approved three bills, including legislation I am sponsoring to update and revises the Older Adults Protective Services Act. Senate Bill 899 aims to detect and reduce elder abuse in the Commonwealth as well as provide protective services for Pennsylvanians over 60 years of age. The committee also approved House Bill 2468, which requires any government agency to obtain Orphans’ Court approval before using eminent domain to take permanently preserved land. The Senate is in recess and is expected to return to voting session in September.